With a generous glass reservoir and large feeding tray this feeder is suitable for all types of seed eating birds, large and small. 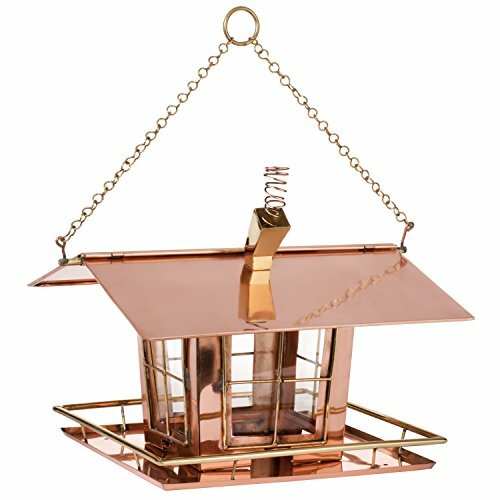 Copper house comes complete with details like welcoming four-paned windows, a smoking chimney, and a porch railing that doubles as a comfortable perch for birds. : Overall Height - Top to Bottom: -10". Overall Width - Side to Side: -12". Overall Depth - Front to Back: -12". Overall Product Weight: -7 lbs. With a generous glass reservoir and large feeding tray this feeder is suitable for all types of seed eating birds, large and small. Copper house comes complete with details like welcoming four-paned windows, a smoking chimney, and a porch railing that doubles as a comfortable perch for birds. : Overall Height - Top to Bottom: -10". Overall Width - Side to Side: -12". Overall Depth - Front to Back: -12". Overall Product Weight: -7 lbs. This stunning feeder, with its beautiful vine-like design will bring the tiny hummingbird from all around to eat. Featuring a durable, tempered tinted glass nectar container and 4 copper flower feeding ports. The nectar container holds 32 fl oz of nectar - plenty for all of the hummingbirds who will flock to it! Its tinted glass reservoir makes it easy to monitor the nectar levels and unscrews easily from the feeder base for quick cleaning and filling. 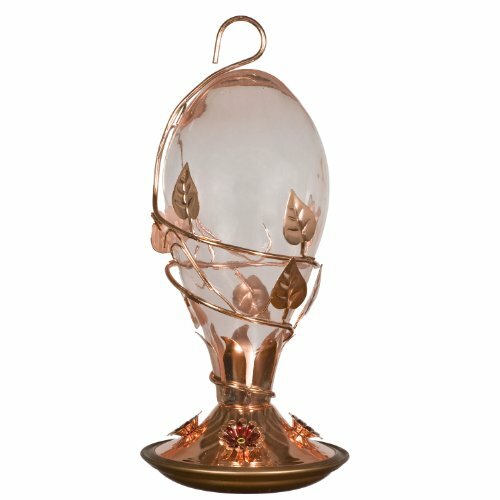 These innovations make for one of the most economical and convenient glass hummingbird feeders on the market! Remember to clean your bird feeders at least twice a week, more often in very warm climates or seasons. 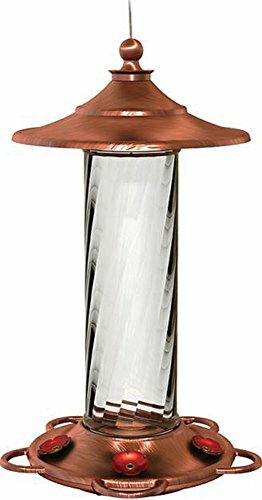 This brushed copper hummingbird bottle feeder has five feeding porches and five perches. The large bird feeder holds 14 fluid ounces of nectar. The clear glass makes it easy to see the red hummingbird nectar so you will always be able to tell when you need to refill it. The flower basin has hummingbird attracting red feeder flowers.